I fell in love with country life. The mountains. The friendly people. The awesome food. The deliberate slowing down of life in general. I even almost bought a super expensive Dirndl which I would have probably worn only once at the Oktoberfest and then never again. What happened to me? Since the sun started to shine constantly I was on a permanent high, probably induced by the sudden availability of endorphines that lacked before, when there was only rain. But on day seven I also took a very nice trip to Europe’s highest waterfalls – the Krimmler Waterfalls, which upped my mood even more. Those waterfalls are 380 meters high and you can walk up their full height. The walk up there is no picnic, but you will be rewarded with spectacular views and refreshing splash water. After reaching the top you should definitely continue hiking in the Hohe Tauern National Park until you reach Veitalm (have a Raspberry water there, it’s delicious and not too sweet). You will be walking in a beautiful scenery of rivers, mountains and meadows – honestly the most beautiful scenery I have seen so far. On the last day of my holiday the hotel offered a so called “challenging hike”, where we were supposed to overcome a difference in altitude of a 1000 meters. I was like “Let’s do this!” – so I got up at seven am, had a hearty breakfast, put on a ton of sun screen, packed water, supplies and my very fashionable headband that prevents my forehead from getting burned and waited at 8.55 am at the hotel’s entrance, ready and motivated. We were a group of approximately 12 people, all older than me and some of them not very sporty. The temperature had already risen to 25 degrees. Our guide predicted three to four hours for the ascent to Klingspitz, a timeframe that would have been totally fine for average weather conditions. But already after walking up an hour in the burning heat that got hotter by the minute a lot of the people in our group started to pant and feel dizzy. So our guide decided to change the route due to the heat – which was the right thing to do, obviously, but nevertheless I felt disappointed. I had really looked forward to this physical challenge on my last day. 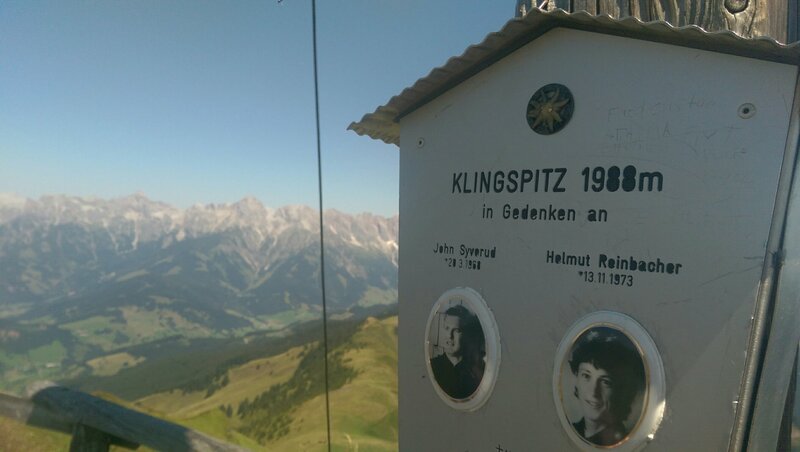 Fortunately, two crazy guys – Volker and Peter – wanted to climb the mountain anyway, despite the blazing heat. And so I joined them and we did it: we forced our bodies to take us up the mountain and reached the summit at half past twelve. And it felt awesome. It was the perfect ending to a vacation that started not so perfect, but all in all turned out great. Even the rainy days – they provided time to read and write and contemplate some things that normally drown in the daily routine. Without the rain I probably would not have started writing these blog posts – and the world would have never known of beautiful Dienten, Klaus and Anneliese or where to get the best Kaspressknödelsuppe. So thank you, bad weather, your rough patches have made my vacation even brighter. Lesson learnt: Things don’t need to be perfect to be good, sometimes it’s imperfection that leads to the best result.